Just recently, browsing for enhancing ssh security solutions, I've come across an interesting tool. 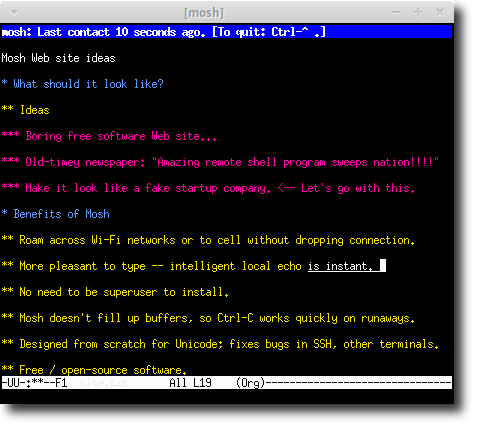 Mosh is a remote terminal application that allows roaming, supports intermittent connectivity, and provides intelligent local echo and line editing of user keystrokes. Mosh is a replacement for SSH. It's more robust and responsive, especially over Wi-Fi, cellular, and long-distance links. Mosh is free software, available for GNU/Linux, FreeBSD, Solaris, Mac OS X, and Android. Mosh fixes several Unicode bugs in existing terminals and in SSH, and was designed as a fresh start to try to be robust and correct even for pathological inputs. where username is a login for remote machine and host is it's address. You can remotely access your Pi via Mosh even from Windows and Android phone. On Windows, install Cygwin and Install the experimental package from the Cygwin setup.exe (All >> Interpreters >> mosh). For Android you can use one of the best ssh clients - JuiceSSH. The recent update v1.4.0 implements mosh support.